The history of the village Nakovana or also called Nakovanj is explained as an interesting legend. Once upon a time, there were three brothers on the Peljesac peninsula. They decided to split up. The first brother was given a small cottage or forge, in Croatian called kuciste. 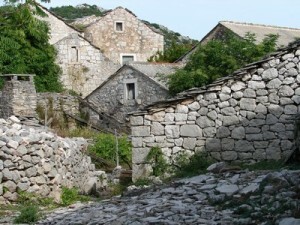 The settlement, which was then formed around his home is so named Kuciste, and is nowadays very popular among tourists. Another brother got forging tongs, in Croatian called viganj. So the town Viganj was named after the second brother. The town is great for surfing, sailing and kite surfing. The third brother got blacksmith anvil, so his village is since then named Nakovana, like the Croatian word for blacksmith anvil. But it was not meant for Nakovana to stay populated. In fact, Nakovana consists of two small villages – Upper and Lower Nakovana. After the latest population census in 2001, there are only four people left in Nakovana. The Upper Nakovana is abandoned, but in Lower Nakovana there is a renovated house where it is still possible to find some people. Residents of Nakovana emigrated to other parts of the island (they also founded a settlement named Loviste), as well as on the mainland, where the prospects for life were much better and so the original village became almost empty. Ston was known for its salt pans, on the other hand, Nakovana was known for its large plantations of olives, which were the largest on the peninsula of Peljesac and also it could be compared to the olive groves in other parts of Dalmatia. As Nakovana is now abandoned, also olive groves are, and they can not be harvested any more. Certainly, this is an interesting area for tourists, as Nakovana left behind many historical monuments. Visitors can see the archaeological remains from the Neolithic period, found in Spila Nakovana. It is also possible to see the Illyrian sanctuary and cemetery from the 4th century B.C., which proves that that this area was already inhabited in ancient ages. The inventor of the torpedo, Ivan Lupis Vukic also lived in this part of Dalmatia. His house can be still seen there. The whole area around Nakovana is protected as an ecological and cultural zone, and due to its great historical and cultural value, it has a great potential for further development of tourism.